A Dutch braid hairstyle is even referred to as the inverting the French braiding hairstyle or rather the pineapple braid hairstyles. Usually, when the braids are made, the hairs are separated into three sections. The uniqueness of this hairstyle lies in its making. The braids are created by crossing the hairs under each other. Moreover, in the end, it appears like the entire strand is entirely incorporated in a woven pattern. Sometimes, even many such braids are designed and then carved in a beautiful pattern which helps in giving an attractive look. It is entirely dependent upon the quality of your hairs which decide what the outcome of your hairs would look like. You can make a bun or merely a ponytail the result will be no doubt exceptional. The Dutch braids on black hair give a commendable look. Every time a female coming out with such output, is always appreciated by the views. Moreover, now people even make a proper decoration to the hairs by using the clips, studs, etc. Grabbing positive opinions in favor of this hairstyle, people quite enjoy these hairstyles. This article has given a list of the top 15 Dutch braid hairstyles with images which are very attractive and has traditional look also. This look is ideally meant for sportswomen. This braid locks the hair away from the face and makes it easier to play. This look can be achieved by parting the hair in the corner into 3 sections. Hold the 3 sections apart, and twine them along each other, so as to make a braid. When the braid is over, twine it. Your look is complete! Make sure the twine is over the middle of the scalp. 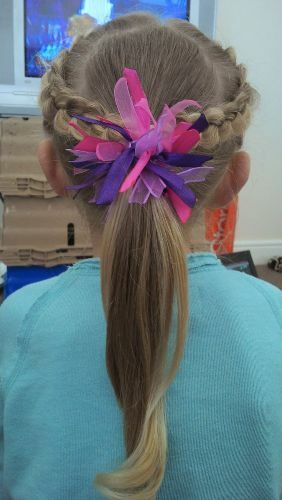 If you want, you can even twine ribbons of the colour of your sports team into the hair, to make it look colourful. Suitable occasion or party: Ideal for the sports game or tournament. Suitable dress: It best goes with the sportswear. This is a classic Dutch braid look. This is ideally meant for schoolgirls, but since this braid is so exquisite, this look can be made for parties too. This look can be achieved by parting the hair in the corner into 3 sections. Hold the 3 sections apart, and twine them along each other, so as to make a braid. Keep on braiding the hair till you reach the end, and then tie the ends together so that the braid does not come off. Your look is complete! While making this braid, it is important to remember that the braid pattern has to be tight so as to hold it in place. This braid is best meant for those with long, thick hair. Suitable occasion or party: Formal parties or any public gathering. Preferred age group: Mainly for the kid’s section. Best season to wear: Goes well in all season. Suitable dress: Almost every dress. This look is mainly meant for bridesmaids, at weddings, or little children. To get this look, take the hair from one side of the head, near the temple. Begin by parting the hair in the corner into 3 sections. Hold the 3 sections apart, and twine them along each other, so as to make a braid. Keep on braiding the hair till you reach the middle. Then take the hair from the other end of the scalp. Hold the 3 sections apart, and twine them along each other, so as to make a braid. Keep on braiding the hair till you reach the middle. Then lock the two braids together in the middle and add ribbons to make it look colourful. Your look is complete! Suitable occasion or party: Bridal parties or any parties. Preferred age group: Suits people of all the age group mainly kids. Best season to wear: It goes well in all the party season. Suitable dress: All the party wear. 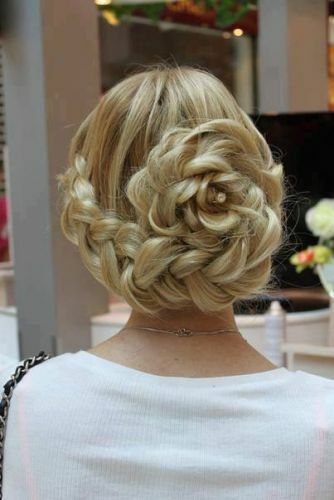 This style of Dutch hair braid look is mainly meant for the bride at weddings. This look can be achieved by parting the hair in the corner into 3 sections. Hold the 3 sections apart, and twine them along each other, so as to make a braid. Keep on braiding the hair till you reach the end, and then tie the ends together so that the braid does not come off. Twine the braid in the shape of a flower. Your look is complete! This type of Dutch braids hairstyles look is meant for offices. This look can be achieved by parting the hair in the corner into 3 sections. Hold the 3 sections apart, and twine them along each other, so as to make a braid. Keep on braiding the hair till you reach the end, and then tie the ends together so that the braid does not come off. Then bunch up the end and curl it away from the neck. Your look is complete! Best season to wear: Good for wedding and parties. This curved dutch braid hairstyle look is easy to achieve. Braid the hair diagonally across the scalp to get this look. 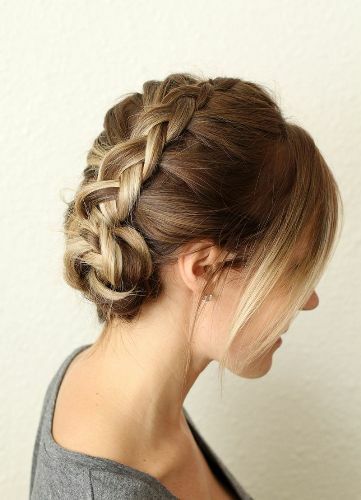 You can make this cute dutch braid hairstyle look with front bangs which are more fabulous than the previous one. Best season to wear : Festive season. Suitable dress: Suits almost every wear. This look, is similar to the previous one, except for the highlights, which make the hair look colourful. This is one of the most beautiful dutch braid hairstyles for girls with medium length hair that is awesome in look. Best season to wear: Good for winter and autumn. This look is similar to the first look, except for the ribbons, which are twinned with both braids to make a mesh. This type of different hairstyles with dutch braids with short hair that is suitable for fashionable events. Preferred age group: Basically for kids. Best season to wear: It goes well in every season. Suitable dress: It is good for the fairy dresses. This look is meant for offices. This look can be achieved by parting the hair in the corner into 3 sections. Hold the 3 sections apart, and twine them along each other, so as to make a braid. Keep on braiding the hair till you reach the end, and then tie the ends together so that the braid does not come off. Tie the rest into a ponytail. 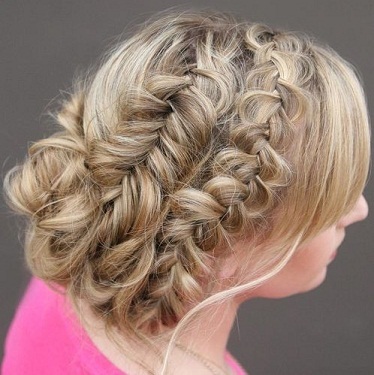 This Dutch braid hairstyle has a double thickness as that of the single braid. 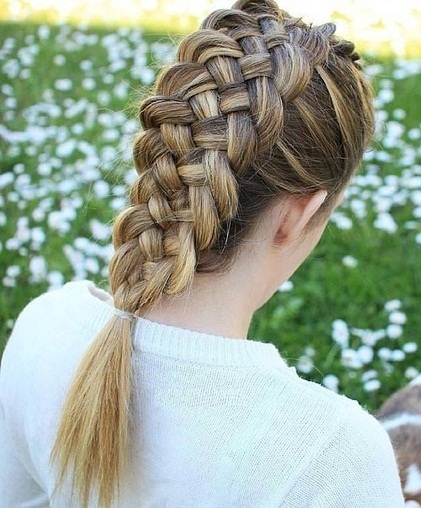 If you want to highlight and flaunt your braid, just try out this one. Having long hair and engrossed in a braid, style your hair with the double Dutch braid. You will look so stylish and fancy. 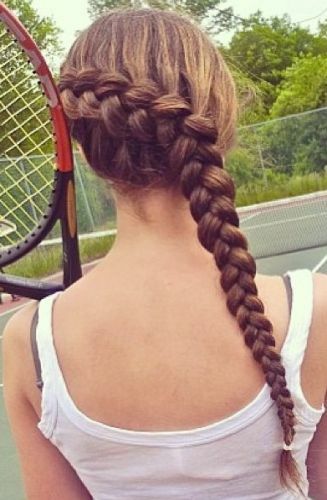 In Dutch style braid, it seems as if two pieces of the hair are fused together. But in a French braid, three pieces of hair are weaved on top of each other. 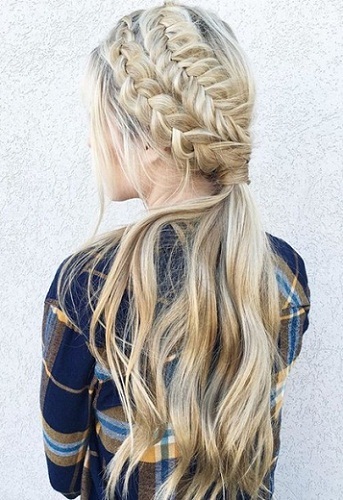 This double braid adds height to the part of your scalp as it in the picture in sideways. The lower portion of the hair is left open by tying the neck part hair with a strand. If you are wondering how to make different styles with braids, try this at home. It’s really catchy and informal. Suitable dress: All the ethnic and party wear. This type of dutch braided hairstyles is a formal type hairstyle other than the above style. This style makes you elegant with a neat bun. In spite of both the braid and bun effect in this single style, it won’t make your hair looks stuffy. Reverse braid which is near your neckline, underneath the ballerina bun gives it a classy look. The side of the ballerina bun is wrapped with the braid, enhancing the bun even more. Suitable dress: It best goes with the Lehenga and Churidars. The messy effect is the key feature of this hairstyle along with Dutch braid. If you like to have a perfect and neat braid, this isn’t the idea in this style. 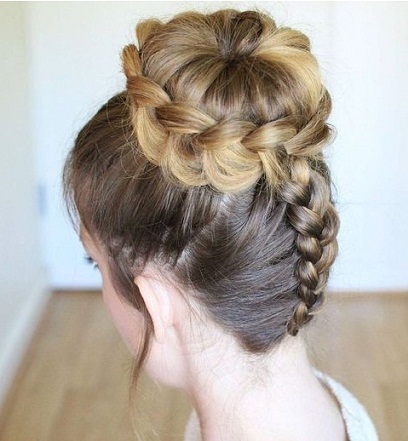 The messy texture of the braid is blended with a loose and low messy bun. You can additionally feature to this hairstyle by adding fringe bangs. 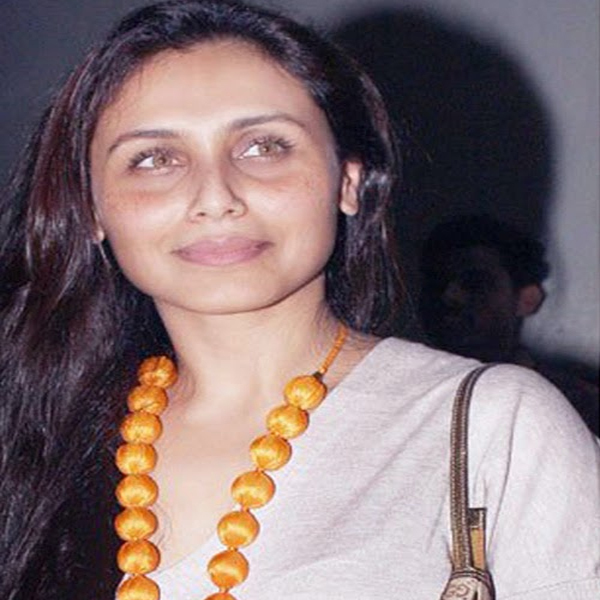 A low updo with side braid is the main characteristics of the braid hairstyle. Incorporating different patterns of braid by experimenting provides you a properly different look. Best season to wear: Goes in all season mainly festive moods. A high bouffant adds height to your face shape. So, small or round face shape can opt for this style. Bouffant creates a crown-like effect to your hair. The bump part is highlighted with the Dutch braid coming from the sides of your ear. This is a much-seen hairstyle in fairy tale stories and its popular hair styling. Adding curls to the free ends of the hair using curling iron looks beautiful. You can also highlight a few strands of hair to make the curls prominent. Ensure that you wear this fairy style look in a special event like a wedding ceremony or other events. Preferred age group: Suits all the female folks. Best season to wear: It goes well in every party season mainly winter autumn. Suitable dress: Goes well with all the ethnic wear mainly lehenga. 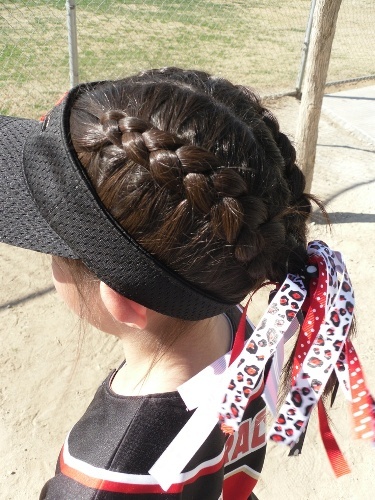 This style is different from the conventional Dutch braid patterns. 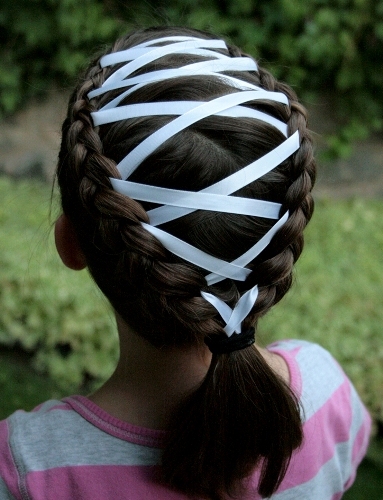 You can move your focus from the standard Dutch braid styles to this regal ribbon texture. This is a unique style and fashionable. This incredibly versatile style pulls backs the hair away from your face. It works for day and night as well. Ribbon-like structures make it look more interesting and exciting. It is neat and polished for everyday wear, also gives a formal look. Preferred age group: Best suited for the teenagers. This rendition adds a new aspect to the standard patterns of regular schoolgirl braid. Central parted braids are not the idea over here. Skipping the central parting feature along with two sides Dutch braid is done in this style. Pulling each section of the braids make it looks chunkier. You simply look cute wearing this hairstyle in any event. You can come up with this bridal hairstyle too. Suitable dress: Traditional party wear. • It is generally said that the braids should be tightly made which would ensure that it would last for a more extended period. • Even the use of hair sprays is highly recommended. This makes sure that no piece of hair comes out of the braids. • Users are strictly instructed to make the braids when the hairs are in a wet condition. 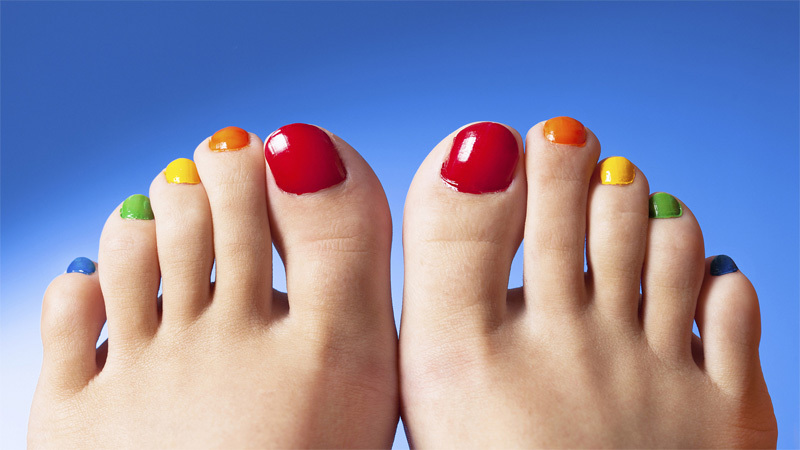 Even adding some adequate amount of cream or wax helps in adding a little shine and luster. • Moreover, the strands need to be perfectly combed to avoid the bumps in the later stage. • Viewing some tutorials added by the different websites and seeking advice from professional experts helps you to be aware of many things. The Dutch braid hairstyles are considered to be a gorgeous hairdo. Personally, if I need to select any one piece, even I will be left with a lot of confusion. 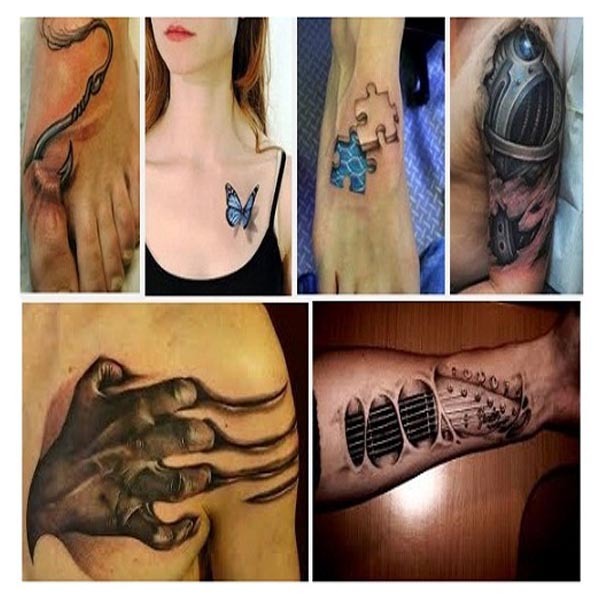 Every design has got its uniqueness and charm. The best part is that you also do not need the involvement of any other person. So, you need to opt for any variety of hairstyle as per your personal choice and let us know about your experience. Your feedback is essential to us. Thank you. 1. Will I be able to sleep with the Dutch braiding hairstyle patterns? Well, there lies no problem if you sleep with your braids. However, the only problem comes when you have to deal with the frizzes. So, to save the hairs from coming out or protecting it from the frizzing, it is better said to make us of the silk pillows. It provides safety to the strands. 2. Are the Dutch braids good for the thin hair or the thick ones? You cannot make such differentiation. Dutch braid for thin hair suits every female, in the same manner; it gets on the thick hairs. To be precise, almost all the people enjoy the different hairstyle in a wholly more comfortable and flexible way. 3. Many hair problems have evolved nowadays. Will it be wise to make use of such hairstyles? You may find it quite surprising that the Dutch hairstyles are considered to be one of the protecting techniques for the hairs. While people have problems relating to their hair volumes and bumps, this hair styling pattern would even help you in the best way.